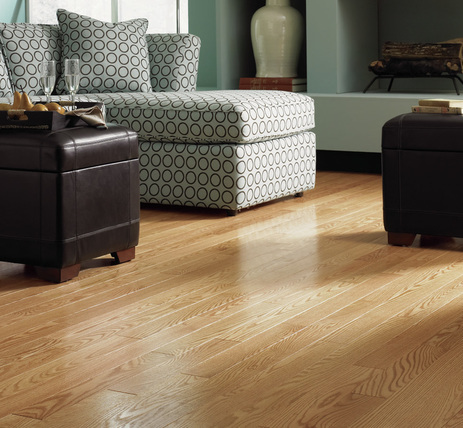 Hardwood - A classic floor covering that adds long-term value to your home. 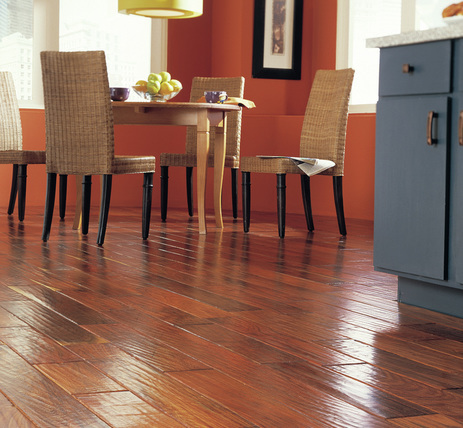 ​Nothing says "home" like the natural, timeless beauty of a hardwood floor. True hardwood is 3/4" random lengths. 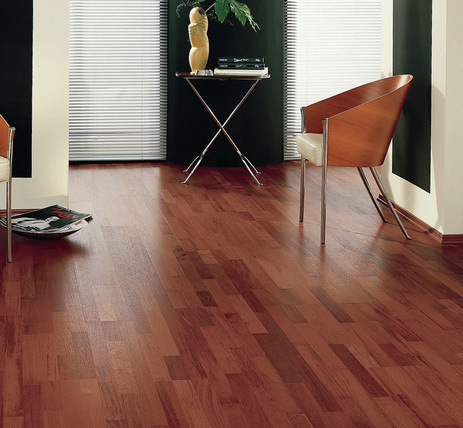 As a flooring material, wood is superior to vinyl or carpet, both practically and aesthetically. A solid wood floor is more than a covering; it adds strength and stability to the floor system. A one-inch thickness of wood has the same insulating value as 15 inches of concrete. Wood is durable and long lasting. Many different factors affect the way the finished floor will look, from the nature of the living tree to the way the lumber is sawed. The Janka hardness test measures the force required to embed a .444-inch steel ball to half its diameter in wood. It is one of the best measures of the ability of a wood species to withstand denting and warping. By the same token, it is also a good indicator of how hard or easy a species is to saw or nail. Northern red oak, for example, has a Janka hardness rating of 1290. Brazilian cherry with a rating of 2350 is nearly twice as hard, and much more difficult to cut and nail for a project. Heartwood is the older, harder central portion of a tree. It usually contains deposits of various materials that often give it a darker color than sapwood. It is denser, less permeable and more durable than the surrounding sapwood. Sapwood is the softer, younger outer portion of a tree that lies between the cambium (formative layer just under the bark) and the heartwood. It is more permeable, less durable and usually lighter in color than the heartwood. The relative amounts of heartwood and sapwood in a flooring batch may affect the way it accepts stain and finish and, therefore, the finished appearance of the floor. In general, quarter sawn and rift sawn flooring will contain less sapwood than plain sawn flooring, and tends to have a straighter grain and more uniform appearance. Heartwood is also more dimensionally stable than sapwood, so flooring with a high percentage of heartwood will shrink and swell less than flooring that is mostly sapwood. For consumers, it’s important to have realistic expectations about how wood will perform. Most wood used for flooring is a byproduct of more expensive wood-consuming industries (e.g., furniture manufacturing) so it is usually not the highest grade of lumber. However, it is quite economical in comparison. Costs vary by wood species, current availability, location and other market factors.